Do you know your county government well? How much did your county allocate for provision of basic services? How much does it collect in the form of local revenues? What was the approved budget for the county in the current or previous financial years? These are some of the questions we will be answering about Garissa County on today’s article. Is it worth the effort? Yes. This is our money. The money spent at the two levels of government is raised from taxes, levies and rates among others. In one way or the other, you pay taxes. Right? If the answer is yes, then you are in the right place. Garissa County is found in the North Eastern religion of Kenya. Its area is 45,720 square kilometers. It borders Tana River County to the West, Somali to the East, Lamu County Wajir County to the North and Isiolo County to the North West. There are 23 divisions and 83 locations around Garissa County. It is made up of six constituencies namely: Fafi, Garissa Township, Lagdera, Dadaab and Ijara. The county’s residents are represented by 30 Members of County Assembly (MCAs). In financial year 2015/2016 the county approved a budget of Ksh. 7.36 billion out of which Ksh. 500 million was to be raised from local sources. The largest portion of the budget (Ksh. 384) was allocated towards construction of roads and infrastructure. This was followed closely by Ksh. 325.1 million which was allocated to water sector. The Office of the Controller of budget reported that most of this money was used to construct water pans, drilling of boreholes and dams. Garissa County is a home to 700,050 people according to Kenya National Bureau of Statistics (KNBS) as at 2012. Generally, there are more males in Garissa (376,285) than women (323,765). 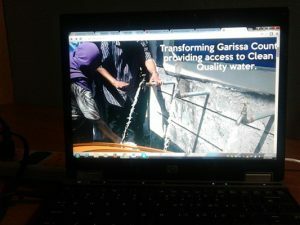 In the first nine months of FY 2015/2016 Garissa County managed to raise Ksh. 77.9 million out of the target of raising Ksh. 500 million for the year. Was the County over-ambitious on the amount of local revenue that they would raise from local revenue? I think so! We hope you found this article useful. Share with us something you know about Garissa County. We will be happy to have a discussion around it.